Most shareholders in Argo Group must have noticed that the company has launched a proposal to buy back shares that requires shareholder approval because it could increase the stake of insiders to a controlling stake. I think that this would not be a positive development if management is unwilling to cash out minority shareholders at a fair price, among other things. Wexboy makes the case to vote against the proposal in a lot more detail here, and I would urge every Argo shareholder to read it (and vote accordingly)! 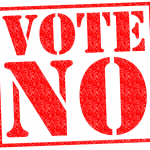 Unfortunately, I’m not able to vote against the proposal because my broker (Binck) doesn’t support it, but if I could I would certainly vote against the proposal. This entry was posted in Portfolio and tagged ARGO.L on February 22, 2016 by Alpha Vulture.